Welcome back to Wildlife Rambles! For this month’s edition I’ll be discussing one of Salem’s most well-known furry friends – the groundhog! Did you guess correctly from last week’s hint? The groundhog is actually a kind of giant ground squirrel, a marmot, in the same family as the tree squirrels we are familiar with on campus, and are native to North Carolina. Other common names for this rodent are “woodchuck” and “whistle-pig”, and its scientific name is Marmota monax. The term “woodchuck” is a misnomer; they neither eat wood nor chuck it! The name comes from a misinterpretation of the Algonquian word “wuchak,” meaning “the digger” – much more characteristic of their behavior. Groundhogs live in burrows they dig with their powerful curved claws on embankments, the edges of forested areas, and meadows. These burrows contain multiple chambers for nesting, hibernation, waste, and to make a quick escape from predators. Some groundhogs even dig a separate burrow altogether just for hibernation. Groundhog burrows can be quite extensive, with up to a dozen entrances, which prove troublesome for farmers trying to remove them from their fields and pastures. Though groundhogs do spend much of their time on the ground, they are also capable of climbing trees and swimming when necessary. Groundhogs are mostly solitary mammals, and usually only live with others of their kind during breeding season or when raising young. Male groundhogs, which grow on average to be slightly larger than females, emerge from hibernation a bit sooner than females, usually around the beginning of February, to find a mate and mark their territory. Groundhogs are mostly herbivores, and, according to the University of Michigan Museum of Zoology, eat foods such as bark, leaves, insects, and birds’ eggs, though they prefer to forage alfalfa, clover, and dandelion. Because groundhogs are diurnal, they are more active in the early morning and evening (and sometimes at night), and prefer to bathe in the sun during the hottest hours of the day. They can reach sizes of up to two feet long, and weigh as much as 13 pounds, getting especially chunky before hibernating through the winter. According to the Encyclopædia Britannica, when hibernating, the groundhog “curls into what appears to be a lifeless ball, its body temperature drops nearly to the ambient temperature of the burrow, and its heart rate decreases from 75 to 4 beats per minute,” and other forest creatures may use the groundhog’s burrow during the winter for shelter. 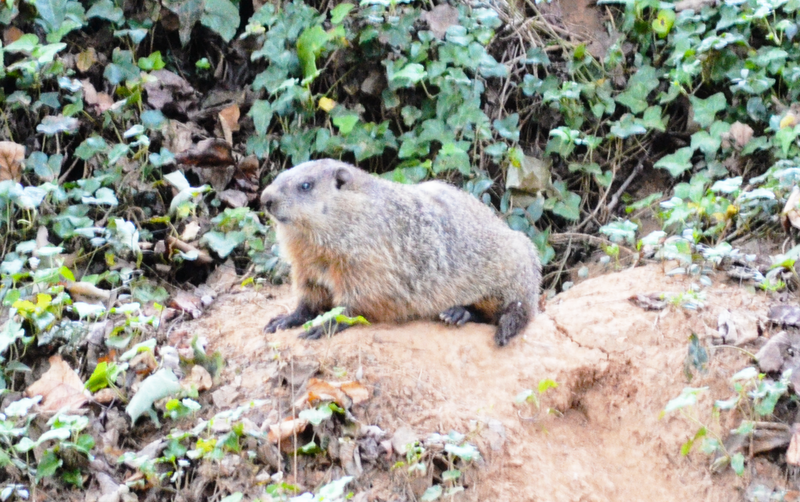 The groundhog pictured was seen foraging for food in the evening, and makes its home in the May Dell. Other groundhogs around Salem’s campus live in the Pit and on the hill behind the Academy. Maybe you’ll be lucky enough to see one of these cute whistle-pigs before they disappear for the winter! Thanks again for reading Wildlife Rambles and I hope you look forward to next month’s adventure!